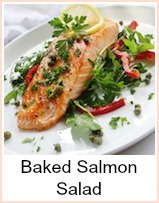 One of the easiest recipes for baked salmon. Use individual fillets or steaks for this. The recipe is for four people, but you could easily adjust it for more or less. This is quick enough to cook for a mid week family meal or elaborate enough to impress for a dinner party. How about having a meat free Sunday roast? The preparation is simplicity itself and if you line the baking tin with foil, you'll cut down on washing up and smells by being able to put the used foil outside straight away. I use a wholegrain mustard - have a look in the shops as you can get some really interesting ones. Preheat the oven to gas mark 6, 200C, 400F. 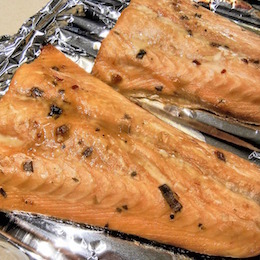 Season the salmon then put onto a flat baking tray lined with greased foil. Mix together the mustard, vinegar and honey. 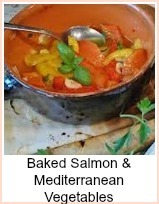 Spread evenly over the salmon and then bake for 15 to 20 minutes until cooked through. 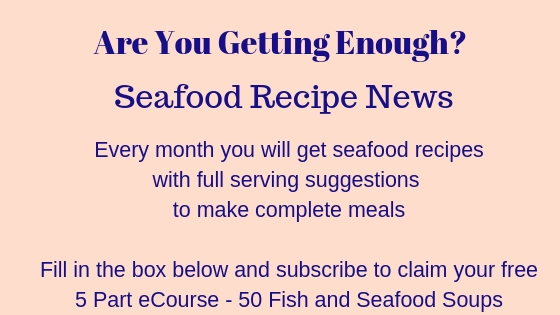 You can test if the fish is cooked by pressing it with your finger - if it's firm to the touch, then it's ready - if it has a bit of 'give' in it, then cook for a further 5 to 10 minutes. Do be careful as it will be hot and you could very easily burn yourself when you touch it. This recipe would be suitable for other fish - it would certainly add some flavor to the blander white fish such as cod, coley or pollack. You can roast some potatoes and other root veg to go with this - try sweet potatoes, carrots, parsnips mixed and covered in olive oil - you would need to start the veg much earlier than the salmon. I would suggest that you do the mixed roast veg for about 45 minutes (cut quite small into even sized pieces) then add the salmon to the oven. Try serving with some salad and buttered new potatoes as an alternative. It makes a great centrepiece for a buffet if you use a whole side and give it the Honey Mustard treatment. 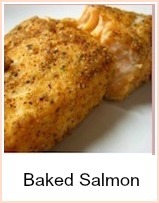 Easy to make but luxurious to eat, baked salmon with a honey mustard coating.